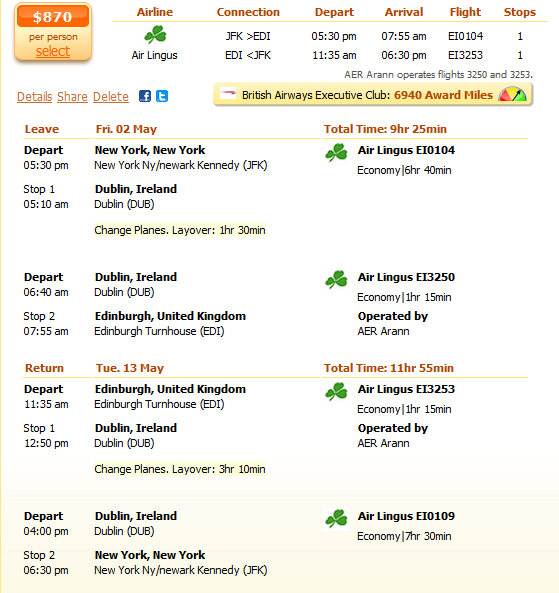 We have found a great deal for you this week: you can fly from New York to Edinburgh for only $870 r/t. It is a deal offered by Air Lingus, departing on May 2, 2014 and returning on May 13, 2014. The prices on economy class start from an extremely low price, $870 r/t. This cheap flight is with no doubt a not-to-miss. You will have the occasion to spend 11 days in the beautiful city of Edinburgh, traveling on low budget. I am sure this holiday will be an unforgettable experience. Do you want to make a booking right now? Use the box below to search for the flight and book it! You can also compare other 3-4 merchants’ offers with our offer. You will fly from New York Ny/newark Kennedy Airport (JFK) to Edinburgh Turnhouse Airport (EDI), departing on May 2, 2014 and returning on May 13, 2014. The prices on economy class start from an extremely low price, $870 r/t. The flight has one stop, at Dublin, with a layover of 1 hour 30 minutes. Thus, the total flight time is 9 hours 25 minutes. The return flight also has one stop, at Dublin, with a layover of 3 hours 10 minutes. The total flight time is 11 hours 55 minutes. You can see all the details in the following screenshot. The next cheapest airfare deal is offered by United Airlines, only starting from $982. This is 12% more expensive than our deal. This flight departs from Washington, having one stop at New Jersey. The total flight time is 18 hours 24 minutes on the way to Edinburgh and 11 hours 34 minutes on the way back to Washington.